Anti-cetuximab antibody is a recombinant, neutralizing anti-idiotypic antibody in full IgG1 format; it is ideal for bioanalytical assay development for cetuximab and biosimilars. It is suitable as a detection antibody in PK bridging ELISA format with HCA220 for an assay to detect free drug. Human anti Cetuximab, clone AbD19830_hIgG1, is an anti-idiotypic antibody that binds specifically to cetuximab and inhibits the binding of the drug to its target. Human anti Cetuximab, clone AbD19830_hIgG1 can be used to measure the levels of cetuximab and biosimilar products using bioanalytical assays. In the HRP-conjugated format clone AbD19830_hIgG1 is ideal for use as detection antibody in pharmacokinetic (PK) assays. It is a fully human antibody and therefore may also be used as a calibrator in immune response assays to measure the anti-drug-antibody (ADA) response in patient sera. Cetuximab (brand name Erbitux®) is a chimeric monoclonal antibody drug (IgG1/kappa) approved for treatment of KRAS wild-type metastatic colorectal cancers and squamous cell carcinoma of the head and neck. This therapeutic antibody, directed against the Epidermal Growth Factor Receptor (EGFR), inhibits tumor cell proliferation by blocking the interaction of Epidermal Growth Factor (EGF) with its receptor. View a summary of all anti cetuximab antibodies. Human IgG1 antibody (lambda light chain) selected from the HuCAL® phage display library and expressed in a human cell line. Conjugated to horseradish peroxidase (HRP) - liquid. Human IgG1 antibody (lambda light chain) selected from the HuCAL® phage display library and expressed in a human cell line. This antibody is supplied as a liquid. 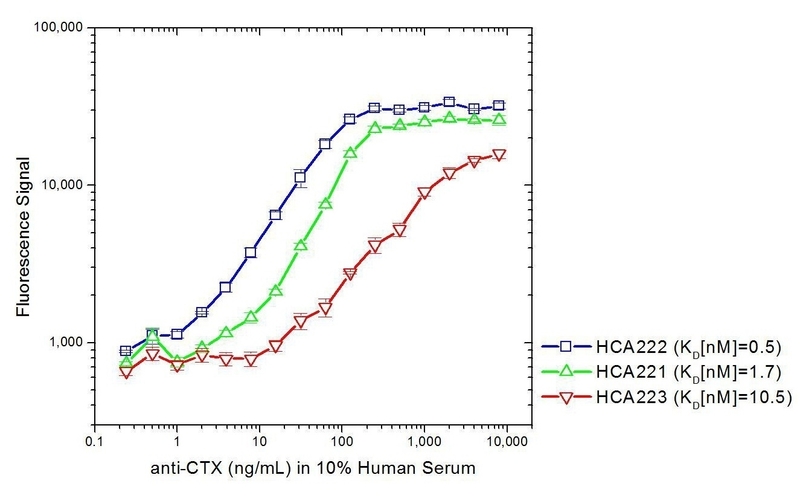 The monovalent intrinsic affinity of HCA221 was measured as KD=1.7 nM by real time, label free molecular interaction analysis on immobilized cetuximab. For in vitro research purposes and for commercial applications for the provision of in vitro testing services to support preclinical and clinical drug development. Any re-sale in any form or any other commercial application needs a written agreement with Bio-Rad. This product may be used as a detection reagent in a bridging ELISA for PK assay development together with HCA220 as the capture reagent. This product may be used in a direct ELISA or as a bridging reagent in ADA assays. Following HRP-conjugation, this product can also be used as a detection reagent in a bridging ELISA for PK assay development together with HCA220 as the capture reagent. Gomez, D. et al. (2013) Cetuximab therapy in the treatment of metastatic colorectal cancer: the future frontier? Int J Surg. 11 (7): 507-13.